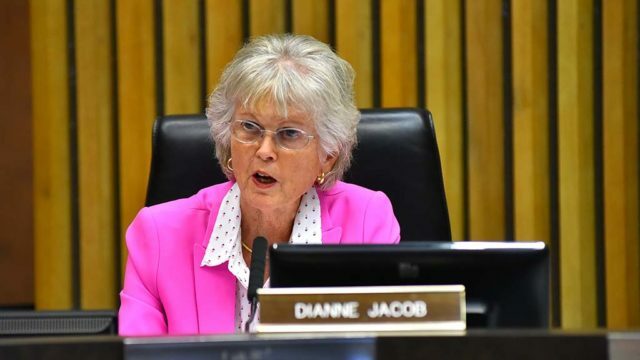 Supervisor Dianne Jacob Wednesday unveiled numerous proposals, including improved mental health treatment and affordable housing, during the annual State of the County speech. Jacob said the county is encouraging low-middle income housing with several projects, two of which are under way, for a total of 453 homes. Because many people living on the streets struggle with mental illness, Jacob said the county must have a better coordinated system of care. By working with hospitals, business, law enforcement, schools and nonprofit agencies, the county can create a plan that stops the revolving door or emergency rooms and jail cells, she said. Jacob said that District Attorney Summer Stephan and Sheriff Bill Gore will join her in asking the board to bolster psychiatric emergency response teams, by allowing clinicians to stay in contact with patients and establish PERT teams in schools. She told the audience about a man named Ryan, a sexual abuse victim who cycled through clinics and courtrooms and made several suicide attempts before receiving treatment, housing and job training. Jacob said the county has more than $745 million in projects that will be started or completed over the next two years, including a nature center in Santa Ysabel, a campground in the Tijuana River Valley and an enhanced regional emergency communication system. However, “public safety must remain our top priority,” Jacob said, crediting county law enforcement for their daily efforts. The county government buys the bulk of its electricity from providers other than San Diego Gas & Electric, Jacob said, adding that eight local cities, including San Diego and Oceanside, are moving toward energy choice. “If the county can shop for energy, why not the rest of us?,” she asked.